“Urgent coordinated action is needed to restore the health of the world’s oceans and secure the long-term well-being and food security of a growing global population,” the UN Food and Agriculture Organization (FAO) said about the key message of the four-day summit, which is co-organized by the World Bank and Member States, including the Dutch host Government. “Healthy oceans have a central role to play in solving one of the biggest problems of the 21st century – how to feed 9 billion people by 2050,” said Árni M. Mathiesen, FAO Assistant Director-General for Fisheries and Aquaculture. On average, 17 per cent of global animal protein intake comes from fisheries and aquaculture, and demand for fish protein is expected to double in the next 20 years, FAO reported, yet some 28 per cent of global stocks are already overfished. More than 500 delegates are expected to attend the event, including ministers and senior representatives from the fishing industry, coastal communities, science and civil society. They will discuss underlying causes that have led to the overfishing, increased marine pollution and loss of critical habitat, as well as potential solutions. The participants will also look at balancing the demands for growth with conservation of marine areas, and ensuring that private sector growth does not come at the expense of protecting the livelihoods of local communities. “Solutions exist that balance the ecological and economic demands on the ocean,” said Juergen Voegele, Director of Agriculture and Environmental Services at the World Bank. “We have the opportunity to align all our efforts and bring solutions to scale locally. With public-private partnerships and shared approaches we can restore ocean health and provide food and jobs for communities worldwide,” he added. The summit will also focus on blue growth which emphasizes conservation and sustainable management of aquatic resources and equitable benefits to the coastal communities that rely on them. The term “blue economy” stems from the 2012 UN Conference on Sustainable Development (Rio+20), and refers to food, jobs and opportunities for development provided by ocean and coastal assets. 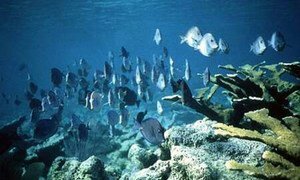 United Nations Member States have begun a series of meetings in New York to discuss the need for an international instrument that would regulate the conservation and sustainable use of marine biodiversity beyond countries’ national jurisdiction.